Home/Inspiration & Advice/$20,000 Ultimate Wedding Giveaway…We Have A Winner! There is always a buzz in the studio before our giveaway winner is announced, and this time it was no different. We are thrilled to name our most recent giveaway winners; Lakeisha and Barry! 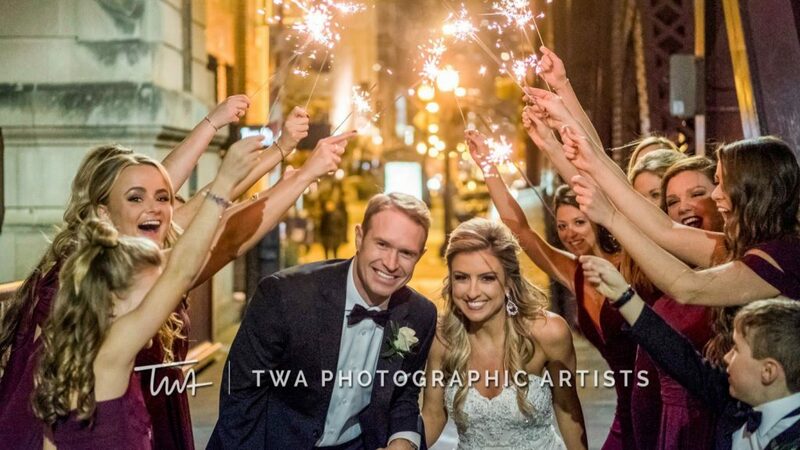 Over the years our $20,000 Ultimate Wedding Giveaway has allowed us to share in so many couple’s wedding days, however we haven’t met a couple quite like these two! Recently we sat down with Lakeisha and Barry to celebrate their big win, learn more about their day and share in all the excitement! We were introduced by mutual friends who thought we would be “good for each other”. I’m unsure what made them think this, but boy they were right! After a few phone conversations, we found out we had tons in common, including a serious love of baseball. Interestingly enough, we can’t seem to agree on what our first date was. I recall it was me coming to see him play baseball! He was amazing and we spent hours after the game talking in the bleachers. His version is that we were sitting on the quad at IIT in Chicago, on a beautiful summer evening, talking under a starry night sky. Whichever was the first date was, it doesn’t matter to us anymore because both were magical! Barry’s proposal was such a surprise to me. We were in Atlanta visiting his family for the Super Bowl; a tradition for his close family. It was halftime and I was engrossed in the television; waiting for Lady Gaga to perform! His mother called me over to her, (I later realized to distract me) and when I stood up and turned around, there he was with flowers in hand. I still wasn’t sure what was happening. Then, he got down on one knee and proposed! I cried so hard, after saying “yes” of course. His family was so excited and there was so much screaming. It was a day I’ll never forget. Our engagement has been great. We’ve received a great deal of support from both sides of our family. We both dreamed of a wedding that was unforgettable. Barry has been a huge help with planning, and that has helped me put together our shared vision. While we were taking all the planning in stride, different pressures started to stack up. Then we found out we won the giveaway! It was a tremendous blessing to us. I remember calling Barry, my Mom, and all my bridesmaids to tell them the good news. I was standing outside of my job jumping up and down and crying while telling them the news. Barry couldn’t believe it when I told him. The TWA crew has been simply wonderful to us, very helpful and just as excited as we are. We’re so grateful to have the contest vendors at our wedding. They’re sure to make everything a dream come true. This is an experience you only see on TV or read about in books, and it’s our life! This will be a cherished memory forever. It has already been such a pleasure to meet with and get to know Lakeisha and Barry and their family; we couldn’t have asked for a more special couple! And, we can’t wait to join the other amazing vendors to create a dream experience! By admin|2018-04-25T20:12:20+00:00February 14th, 2018|Inspiration & Advice|Comments Off on $20,000 Ultimate Wedding Giveaway…We Have A Winner!